In an earlier story about the 2008 H-D sales slump, I wondered whether the then-current slump would extend into the 2009 (and possibly 2010) Harley-Davidson model year sales. Well, I'm sure it won't come as much of a surprise in this economy: Harley-Davidson reports second-quarter profits are off by 91% over the same quarter in 2008. Revenue declined 27 percent to $1.15 billion. Hard times are expected to continue into 2010 as the economy remains weak. Roadcarvin.com does not review or endorse the advertisers appearing above. Fitch Ratings downgraded Harley-Davidson to BBB+, which is several steps above junk status. Further downgrades may be on the horizon. Harley-Davidson announced production cuts of 25 to 30 percent from 2008 levels, and job cuts numbering 1,000 workers. Harley-Davidson stock price remained steady, by some accounts due to the job and production cuts announcements. The stock price is down about 50% over the past year. Author: Michael Curry /// submitted on July 18, 2009 - 9:24pm. Isnt this a bit misleading? Submitted by SH (not verified) on July 22, 2009 - 9:13pm. The big number here is the 27% reduction in revenue NOT the profits. If they paid their employees more based on profits OR reduced their (possible) executive spending then the profits would look much better. Lets face it, they still pulled in over $1 Billion dollars in a depressed market. That in itself is a feet worthy of a reward. Maybe this 'recession' isnt so bad after all considering they were only down 27% on sales where a majority of our county has lost everything! Had to throw my $0.02 cents in here...for what its worth. Oh, there's a silver lining, to be sure. Submitted by Michael Curry on July 23, 2009 - 3:11am. Yes, there are positive aspects to the reports, and H-D's probably doing better than many, but there's no denying that the 'recession' has hurt H-D as it has everyone else. 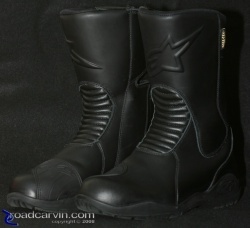 Alpinestars WEB GORE-TEX touring boots.